Dan DeVault. The man at Shifting Gears Cass Lake! Today was a banner day for Shifting Gears. After weeks of email tag Dan DeVault and I finally got to spend the better part of a day together. Dan is a young man from the Leech Lake rez who is currently studying Law Enforcement at the Tribal College. He got into biking a couple years ago, is a dedicated bike commuter, and self taught bicycle mechanic. He loves fixing up cast off bikes for family and friends and has done some bike fixing clinics on his own. A man who hates exercise, he gets how biking keeps us active and fit while enjoying the outdoors, saving money, and getting where you need to go. He writes Ditibiwebishkigan, a blog on all things bicycle and he has the most awesome Raleigh commuter bike you would ever want to see. And here is the best part. He is teaming up with Shifting Gears and Peoples Church to expand the mission of getting low income folks on bikes to the Cass Lake area! 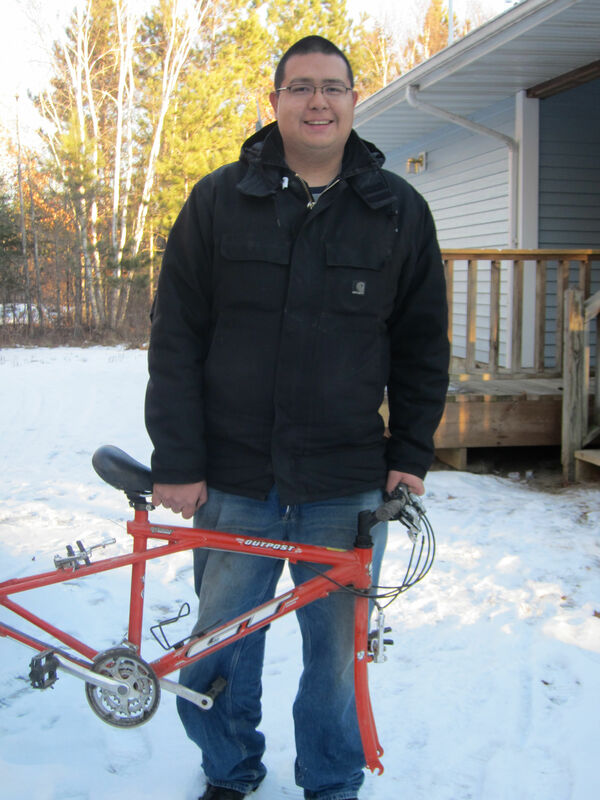 Thanks to Dan and space in Peoples’ newly acquired building in downtown Cass Lake Shifting Gears is able to accept a generous donation of a couple dozen used bikes from Concordia Language Villages. Dan will help organize workspace and fix up these bikes for distribution in the spring. We are looking forward to bike clinics, bike skills classes for adults and children, expanding the adult trike program, and lots of other Shifting Gears activities in Cass Lake. And who knows, maybe Dan will figure out a way to open a bike shop in Cass Lake to take advantage of all the out of town cyclists who show up to enjoy our beautiful trails and provide a boost to the local economy. So we spent this beautiful January day checking out the bikes at Concordia, touring the home shop, and scoping out the digs in Cass Lake. I am really excited about having Dan on board with Shifting Gears. Welcome Dan! I think we’ll be seeing a lot of each other. Yeah! Dan’s an awesome dude! Good luck, Dan!